Okay, I didn't knit while this story unfolded, but knitting is about the only thing I can do now to stem the pain. Yes, it's another episode of: Your Weekly Heartbreak! 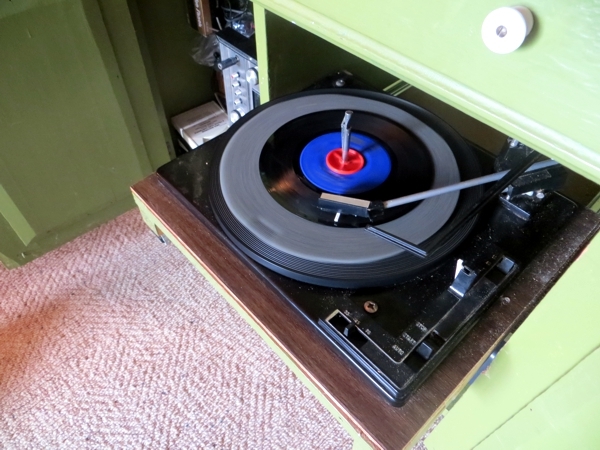 Closing the cottage is not that much fun to do, but if you've got a record player and an amazing collection of LPs and singles from 1950 onwards left by your musically-inclined extended family it has its comforts. 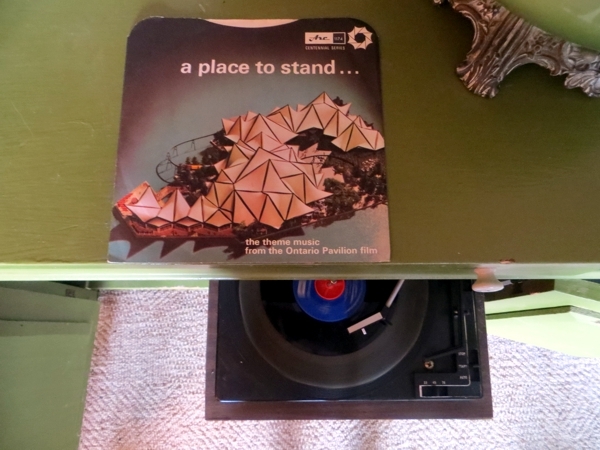 Yes, the all-too-familiar (to Ontarians of a certain age) 'A Place To Stand'. But the B-side. Omigosh, the B-side! It's sort of an orchestral arrangement of the same theme, and it's fabulous. It's stuck in our heads like you can't imagine, except not quite enough to override the A-side, such that it would be really, really nice to be able to find a copy of this music online somewhere. Except I can't. YouTube and the people who upload to it have failed me terribly: this must have been a more rare recording, and to make matters worse, it never occurred to me to photograph the back of the sleeve so I could search on its actual name. Not that it would help probably because I've searched with every imaginable other term related to Ontario Place, Expo 67 Theme, and so on and all I get are a lot of different singles and LPs. There is nothing for it but another trip to the cottage before winter, and obviously a subsequent, professional recording of the music itself because shazam! It's so pretty. And now you can go back to knitting or doing whatever awesome thing you had going on today - see you tomorrow, hopefully with some knitting to show off but I'm still catching up with admin things post-basement (no, it's still not done, I'm just on a break) so maybe I should spare you altogether, except that I won't because Hello, I am Chatty! Aren't you lucky?